MOSCOW, April 16. /TASS/.The US and its allies sought to hit Syrian military targets, including airfields, during their missile strike, Russian Defense Ministry Spokesman Major-General Igor Konashenkov said on Monday. "The true targets of the strike delivered by the US, the UK and France on April 14 were both facilities in Barzeh and Jaramani and Syrian military facilities, including airfields," he said. According to Konashenkov, a photo of a facility located in the Barzeh area shows that "the destruction caused by the missile strike does not correspond to the scale of destruction from the use of three dozen cruise missiles." "Moreover, the survey of this and other facilities revealed neither this number of ammunition fragments nor the corresponding number of craters," he added. A mere thirty missiles would be more than enough for destroying the facilities the Air Forces of the US, UK and France chose as targets for last Saturday’s missile strike, Konashenkov added. "One can see perfectly well from the satellite photos circulated by the Western media these are ordinary buildings on the surface," he said. "I’d like to recall that the Tomahawk missile warhead is equivalent of 500 kg of the TNT depending on its type." "That’s why, whatever the method of computation, a mere ten missiles would be enough to destroy each of the three facilities even with account of a three-fold margin," Gen Konashenkov pointed out. As many as 112 surface-to-air missiles, including 25 Pansir missiles, were used by Syria’s air defense forces to repel the strike delivered by the United States, France and the United Kingdom, Russian Defense Ministry spokesman said. "A total of 112 surface-to-air guided missiles were used to repel the strike," he said, adding that 23 out of 25 missiles fired from the Pansir-S1 system had hit their targets. "Twenty-nine missile were fired from the Buk system, with 24 of them hitting targets. Eleven missiles were fire from the Osa system. Five of them hit the targets. Thirteen missiles were fired from the S-125 system, five hit the targets. 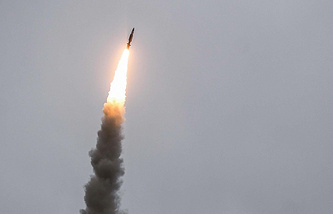 Five missiles were fired from the Strela-10 system, three hit the targets, Twenty-one missiles were fired from the Kvadrat system, eleven hit the targets. Eight missiles were fired from the S-200 systems, none hit the targets," he said, adding that such poor performance of the S-200 system could be explained by the fact that it was meant to hit aircraft. Moreover, in his words, a missile fire from this system hit a fighter jet of one of the neighboring countries not long ago. According to the ministry spokesman, facilities protected by air defense systems suffered practically no damages. "All of the four missiles fired at the Dumayr aerodrome were shot down; 18 missiles were fired at the Blei airfield, all were shot down; 12 missiles were fired at the Shairat aerodrome, all were shot down; two missiles were fired at the T-4 aerodrome, all were shot down; five of the nine missiles fired at the Mezze airfield were shot down; 13 out of the 16 missiles fired at the Homs aerodrome were shot down," he said. However only five out of the 30 missiles and guided air bombs fired at research facilities at Barze and Djaramani were shot down by Syrian air defense systems. 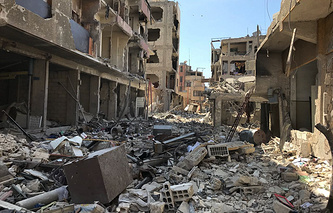 On April 14, the United States, France and the United Kingdom delivered a massive strike on Syrian targets in bypassing of the United Nations Security Council. According to the Russian defense ministry, the missile strike was in the small hours on Saturday. The ministry reported that a total of 103 cruise and air-to-surface missiles had been fired, 71 of them were shot down by Syria’s air defense units. Three civilians were wounded. Neither of the missiles appeared in the zone of responsibility of Russian air defense systems in Tartus and Hmeymim. Russian missile defense systems were not used. The United States, the UK and France said the strikes had been a response to an alleged chemical attack in Syria’s Douma.